“Small children learning how to play instruments” is probably not a sound option on your white noise app for obvious reasons. If you ever had a child in the beginning throes of band class you’ll know exactly what I mean. Heck – my 5-year-old got his hands on a plastic flute and the neighborhood cats hung out on our back porch for weeks. 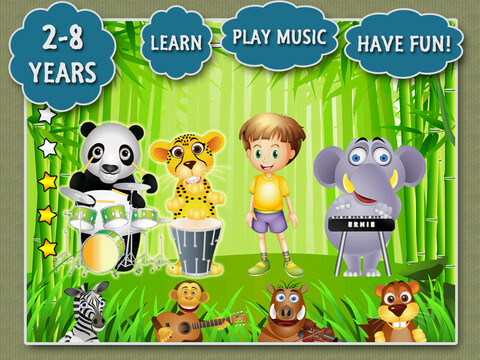 That’s why Panda Band HD is a much better substitute for your budding instrumentalist. 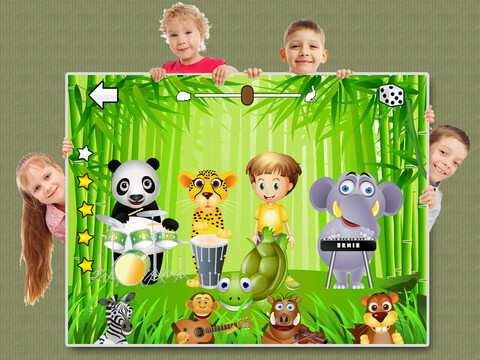 It features a cast of animal characters (and one boy, too) playing different instruments in rotation to the tune of children’s classic “Old MacDonald”. Four musicians take turns on the stage with 5 others waiting to be subbed in, and the volume can be adjusted by tapping on and enlarging or reducing the size of each. My kids (5 & 3) liked this game for the first few minutes and quickly got bored. There are no levels to get through and the only thing players earn is a “toy” after earning 5 stars. We couldn’t figure out how to get the stars but after furiously tapping each musician. The iTunes description claims that the app will help younger kids learn about instrument sounds but they aren’t realistic, and listening to the robotic whining of “Old MacDonald” on repeat actually prompted my kids to turn the volume off. 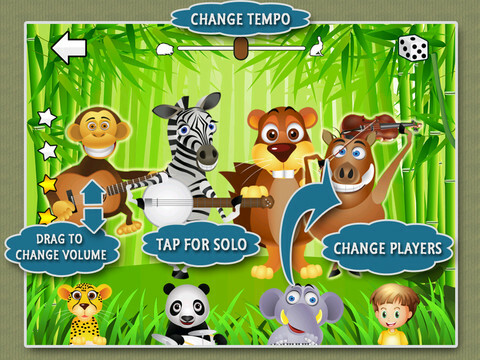 Because this app is free, it’s worth a try if you have an animal-loving budding musician. It’s a great time-buster to keep young (thing 2-3 years old) players busy in the grocery line or waiting room. And let’s be honest – there are a ton of those apps on the market that also include substantial educational content. With a few upgrades, though, Panda Band could be a really fun app but at the time of publishing I would have to say take a pass on this one. What kid can resist animals playing music?